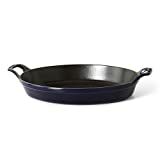 The Staub fry pan browns foods beautifully, be it chicken breasts, potatoes, or bacon. 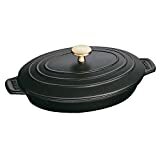 The enameled black matte interior imparts texture, promoting exceptional browning. 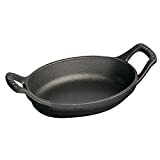 Cast iron offers steady, even heat distribution, so the temperature of the pan won't drop as you cook. 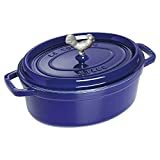 Low, curved sides make it easy to flip the food, which releases easily.Staub enameled cast iron cookware is the choice of the world's best chefs. With exceptional durability, it is perfect for day-to-day use in both gourmet home kitchens and prestigious restaurants around the world. Each piece transitions beautifully from the kitchen to the table. Built to last a lifetime, these heirloom pieces can be passed from generation to generation. Make all of your favorite culinary creations with this American square grill pan from Staub. 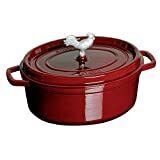 Made from cherry red enameled cast iron, it gives you the feeling of grilling indoors. 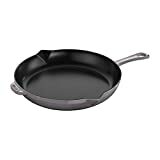 Featuring the classic grill marks on the interior base, this pan is both durable and long lasting. It also has a single long handle with an eyelet hanging hook and two pouring spouts on either side to remove fats and oils. Its smooth bottom is suitable for use on any cooking surface, including induction and it is heat resistant up to 500 degrees Fahrenheit. 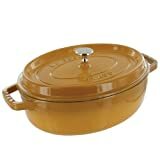 The interior features a matte non-stick enamel finish which is scratch and stain resistant. Because of the technically advanced properties of this interior, the more you use your Staub product, the better it will perform. The oils used and created when cooking will penetrate the pores of the matte enamel and create a natural, smooth non-stick surface.